The Put-In-Bay Condo Golf Carts Rental offers vehicles for rent to the guests of the Waterfront and Pool View Condos. Moreover, our gas-powered carts are among the newest on the island. They were purchased new in 2018. Therefore, they are a reliable transportation on South Bass Island. Reserving your condo golf carts well in advance is highly recommended. During the busiest times of the season, it is not uncommon for their to be a shortage of carts available. In fact, there are times that every rentable cart on the island is occupied! Don’t be left out, plan ahead. Therefore, if you plan on having a cart for your Lake Erie Island Adventure, it is advised to make advance plans. Then, you and your guests will be able to see the island in style! Why Rent Condo Golf Carts? The answer is quite simple: they are fun! 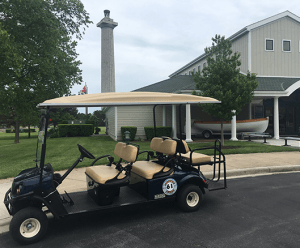 Cruising around condo golf carts on Put-In-Bay puts the island in a different perspective. The leisurely place puts one at ease and helps with the transition to island time. With island transportation, guests can choose their own fun adventure. With a wealth of excellent events and awesome attractions, the advantages of a cart are immense. All in one day can renters see much of the beautiful island of Put in Bay. The answer isn’t if, it is when are you coming to Put-In-Bay? With so much fun on one small island, not coming is not an option. Fortunately, this resource is teeming with information about all things about the island. Browse the Event Calendar and pick out an island event. Check with our Lodging Partners and RESERVE your spot today. See you at the Bay!